Now in an elliptical orbit around the sun, the Tesla Roadster launched atop a SpaceX Falcon Heavy rocket Tuesday during the powerful booster's maiden flight was expected to pass beyond the moon's orbit overnight Wednesday and reach the orbit of Mars in July as it puts Earth in its rear view mirror, analysts said. While SpaceX founder and chief designer Elon Musk has said he likes to imagine the Tesla remaining in orbit for hundreds of millions of years or more, Jupiter's orbit is likely to fling it back to the solar system long before then. Jonathan McDowell, an astronomer at the Harvard-Smithsonian Center for Astrophysics and a noted space analyst, says two forces acting on the car will limit its lifetime. One is Jupiter. The giant planet's gravity perturbs bodies in the asteroid belt and, over time, will have an effect on the Tesla's trajectory. The other effect is a subtle acceleration produced by tiny temperature-related forces over extremely long periods that also would act to change the orbit. "It's tiny, but over timescales of millions of years it's enough to shrink the orbit and make the thing fall into the sun," McDowell said. "So it's a race between does that happen before some Jupiter perturbation ejects it from the system. "On timescales of centuries, it's going to be pretty much in the orbit it's in now. On timescales of thousands of years, it's going to be in a not-horribly-different orbit, but Jupiter will mess it around some. And then on timescales of millions of years, it won't be there anymore." Alan Fitzsimmons, an astronomer with Queen's University in Belfast who studies minor bodies, asteroids and comets, tweeted that his initial calculations show the "chance of hitting a planet is almost zero. Most near-Earth asteroids end by solar vaporization or ejection from the solar system by Jupiter. Near Earth Cars should be the same." "I've done a quick orbital integration for the next 10,000 years assuming a reasonable orbit," he said in an earlier tweet. "Basically the Tesla (Roadster) is OK, but the orbit slowly elongates by gravitational perturbations and starts getting kicked about by Jupiter." Meanwhile, Musk released a spectacular final photo earlier Wednesday from a camera on the rocket's second stage showing the Tesla and its space-suited driver "Starman" outbound with an increasingly distant crescent Earth in the background. 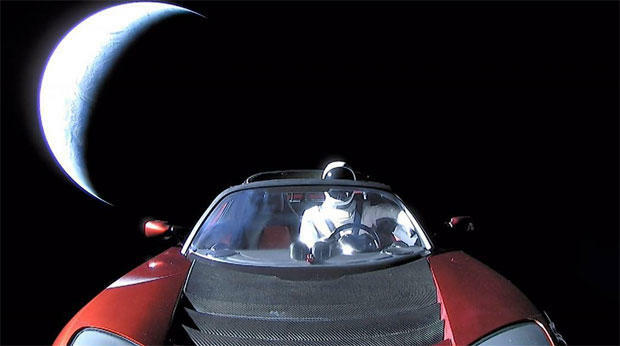 So where, exactly, is Starman heading? About six hours after launch, the Falcon Heavy's upper stage engine ignited for a third time, boosting the Tesla's velocity high enough to carry it out of Earth's gravitational reach. Confirming the rocket firing, SpaceX released initial data indicating the Roadster was headed for an elliptical orbit around the sun with a high point, or aphelion, out in the asteroid belt, well beyond the orbit of Mars. But experienced satellite analysts said the numbers provided by SpaceX didn't quite add up and on Wednesday, the company provided an update that clarified the trajectory. McDowell said the new data show the Tesla is, in fact, in a solar orbit with a high point just beyond Mars, as initially predicted by SpaceX, and not on a long drive deep into the asteroid belt. The data show that when the Tesla finally climbs out of the Earth-moon gravity well, its velocity -- reflected in a number known as C3 -- will be 12 kilometers squared per second squared, which translates into a speed of about 3.5 kilometers per second, or 6,700 mph faster than Earth's velocity as they both orbit the sun. That excess velocity, provided by the upper stage's final rocket firing, is what will enable the Tesla to leave Earth's gravitational clutches and move out into the solar system, a point the Roadster will reach Sunday. It will pass within about 69 million miles of Mars on June 8 and cross the red planet's orbit in July before reaching its farthest distance from the sun -- about 158 million miles -- on Nov. 19. After that, the Roadster and Starman will fall back toward the inner solar system, picking up speed as they near the low point of the orbit, or perihelion, on Sept. 1, 2019. Perihelion in this case roughly matches the distance of Earth's orbit from the sun, the Tesla's starting point. The Roadster then will head back out along the same path, traveling a now-familiar route over and over again for the foreseeable future. What's next for SpaceX and space travel?